Readers of R.L. 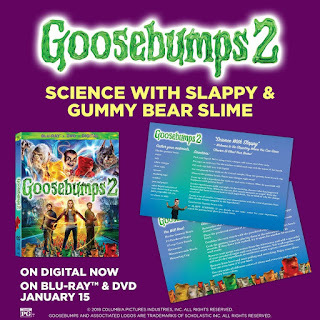 Stine's Goosebumps book series will be excited to hear that GOOSEBUMPS 2 is now available on Digital, DVD, and Blu-ray from Sony Pictures Home Entertainment. If scary is your thing, you're in for some frightening fun. GOOSEBUMPS 2 is rated PG for scary creature action and images, some thematic elements, rude humor, and language. You know your child best. Dive deep in “Thrills & Chills- The Making of Goosebumps 2” with Madison Iseman, along with behind-the-scenes footage and interviews with the cast and crew. “Meet the Monsters” gives fans a sneak peek of how the scary creatures were brought to life. In “Slappy’s Audition,” watch what happens when Slappy auditions for the role he was born to play. 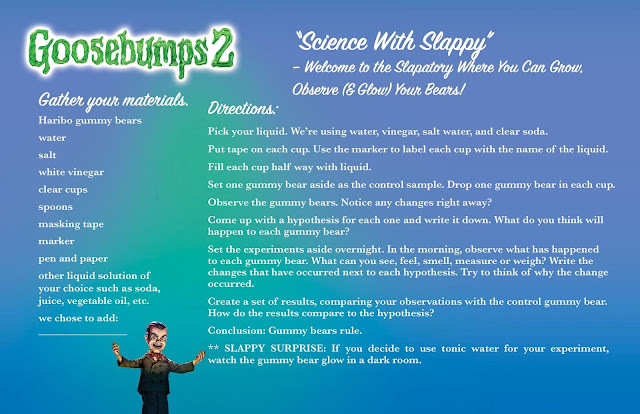 In “Science with Slappy,” enter the Slapatory where Madison, Jeremy and Caleel join Slappy for some electrifying experiments! And get ready to sing along with three hilarious “Slappy-oke” songs. Who knew dummies could sing? Based on the beloved Scholastic book series by R.L Stine, GOOSEBUMPS 2 was directed by Academy Award®-winner Ari Sandel (2005, Best Short Film-Live Action, West Bank Story) from a story by Rob Lieber and Darren Lemke and screenplay by Lieber. The film is produced by Deborah Forte and Neal H. Moritz and is executive produced by Timothy M. Bourne and Tania Landau. GOOSEBUMPS 2 is a Columbia Pictures, Scholastic Entertainment Inc./Silvertongue Films, Inc and Original Film production. No compensation was received for this post. This giveaway is not in any way associated with or endorsed by Facebook, Instagram, Pinterest or Twitter. Giveaway Ends 1/29/19 at 11:59 EST. US Residents **18 and older** only may enter. One entry per household and IP address. Winner will be drawn using random.org and will have **48 hrs** to respond to email or another winner will be chosen. Entries are verified. No purchase necessary. Void where prohibited by law. The number of eligible entries received determines the odds of winning. The Attic Girl is not responsible/liable for prize delivery or lost prizes. Prizing provided by Sony Pictures Home Entertainment. By entering the giveaway, you agree to the Giveaway terms/rules. 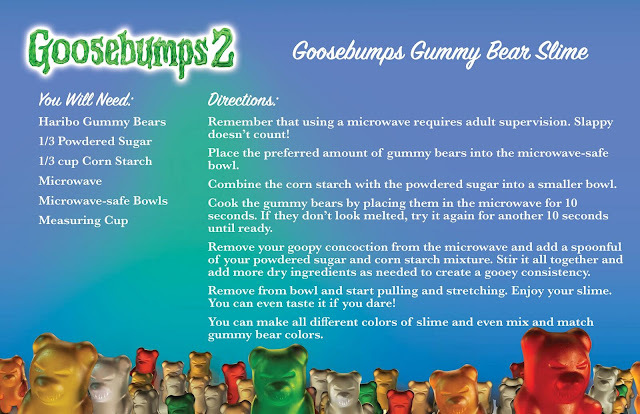 11 comments on "Goosebumps 2 #Giveaway @goosebumpsmovie #Goosebumps2"
Welcome to Dead House is my favorite! It was the first book way back in 1992. I bought it for my nephew and he and I read it 50 times or more. We still have the original copy! Goosebumps: Deep Trouble was my favorite book I read with my grandson because of the adventure and story line. Night of the Living Dummy is my all time favorite Goosebumps book because it’s about the only one that give me actual goosebumps! I've never read any of the Goosebumps books before but I remember my kids reading them but I don't remember the specific titles. It has been years since I've read a Goosebumps books so I honestly couldn't say but I always really enjoyed them! My kids and I have watched the first Goosebumps and would love to see the new one. Is it fair to say I have a tie? My favorite 'Goosebumps' book is a tie between 'The Beast From the East' and 'Attack of the Jack O'Lanterns'. I love them both equally! 'Beast' is an incredibly exciting adventure story of survival. 'Attack' is one of the best stories ever set on Halloween.